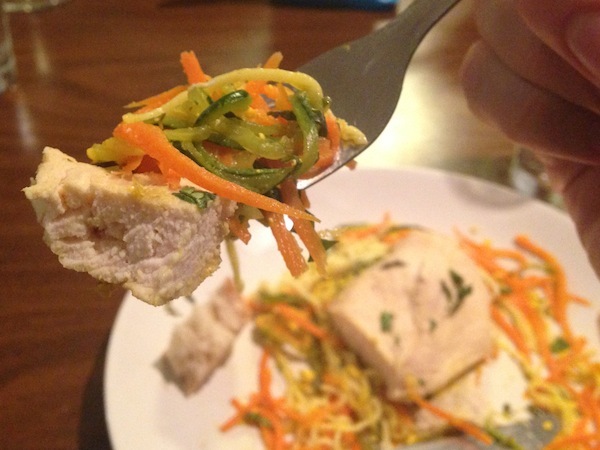 Poached Chicken with Veggie Noodles | Keep It Up, David! 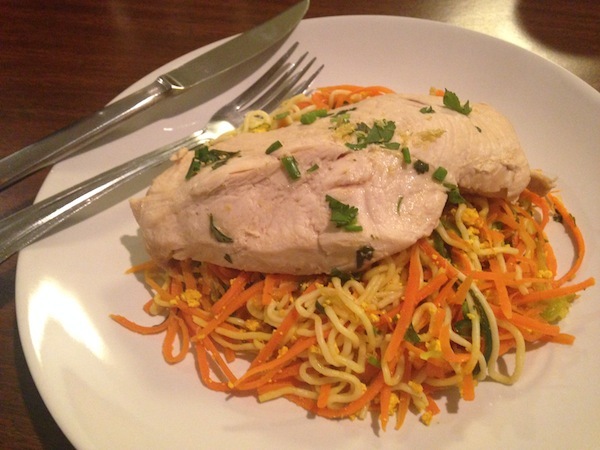 It’s Poached Chicken with Veggie Noodles, and both recipes were modified from articles in the Jan/Feb 2015 issue of Shape magazine. I bought this issue because two blogging friends, Brooke and Dacia, are featured in a great article about life after weight loss. Combined, Brooke and Dacia have lost over 300 pounds. Click their names above to check out their blogs – they’re inspiring women! You may have heard about Brooke. She went viral last year after speaking out when Shape refused to use her bikini photo in an article about her weight loss, and ended up on the Today Show talking about it – twice! Brooke and I were also interviewed on a Bowflex Webcast last summer, so if you’re in a video-watching mood, check this out, too! While I’ve eaten poached meats before, I’ve never actually done it myself, and I’ve wanted to, because it’s easy, healthy, and a great way to impart flavor into your food. 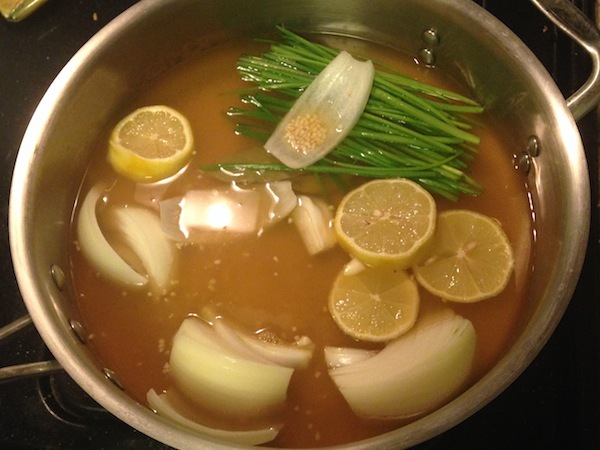 I brought it to a boil, and then turned the heat down, so it simmered. 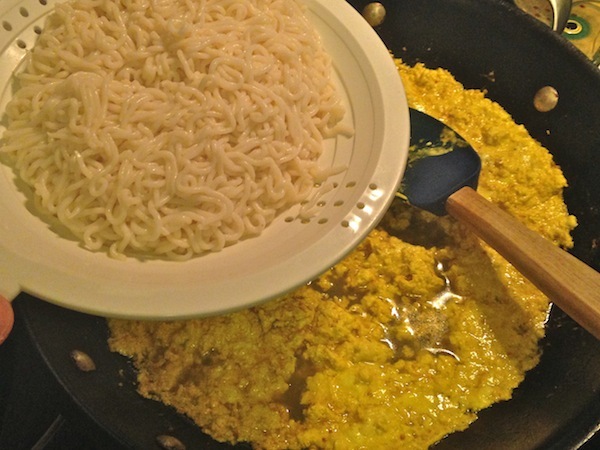 Then I added boneless skinless chicken breasts. There’s five chicken breasts in there, and it made the pan very full. I could’ve done them in two batches, but I decided not to. I had to rotate the chicken a couple times, because the piece on top wasn’t fully submerged. 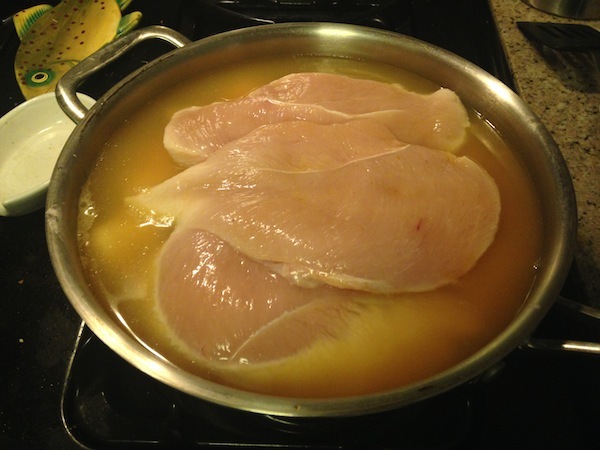 The chicken took about 10 minutes to cook, but that can vary, depending on the size of the breasts. These were huge. Once they’re done, I removed ’em. They’re ready to be served. It’s that easy. 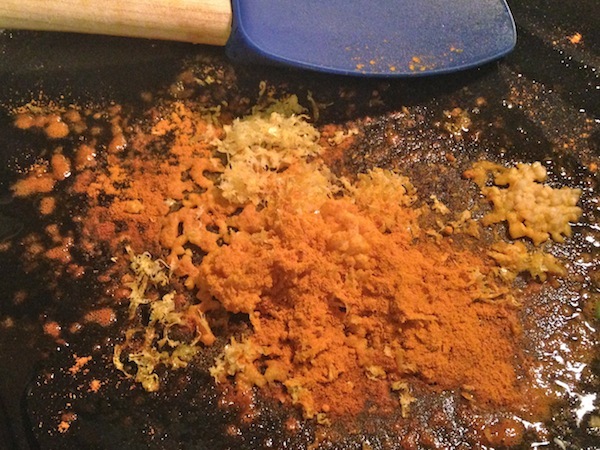 RELATED CONTENT: Check out dozens of healthy recipes on my recipes page! While they were cooking (and while the poaching liquid was coming to a boil, too), I worked on the veggie noodles. I started by julienning carrots and zucchini. 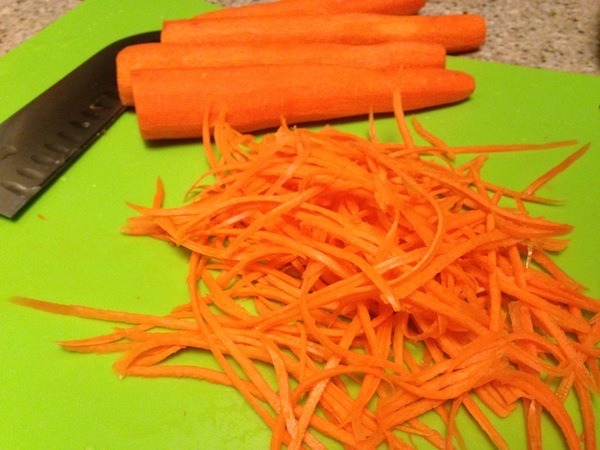 To julienne something is to cut it into long, thin ribbons. It takes forever if you use a knife, but I got for Christmas a julienning tool that looks like a fancy version of a vegetable peeler. 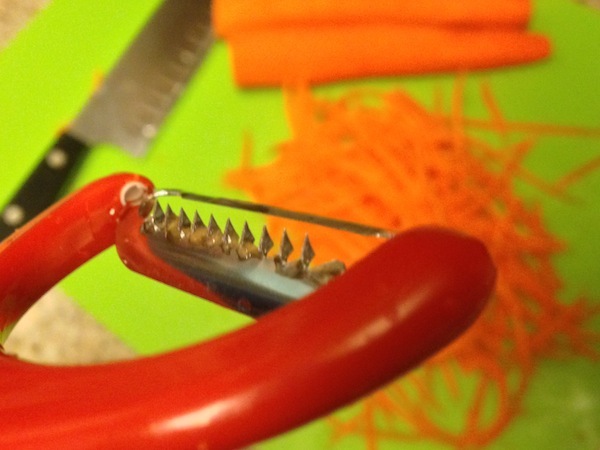 Those little blades are sharp. I know because it only took about 15 seconds before I cut myself. 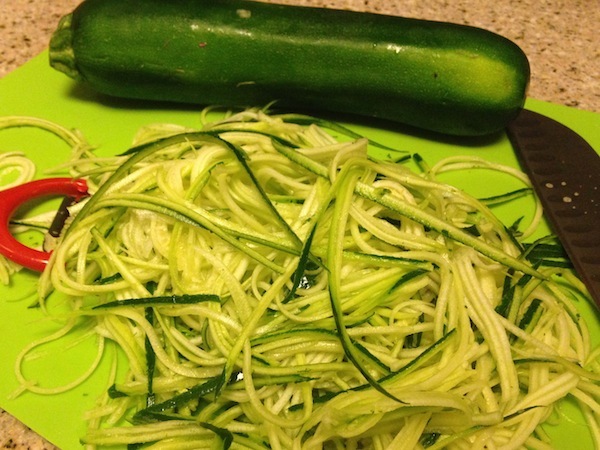 But it works great, and once I returned home from the hospital with my finger reattached, I made quick work of five large carrots and one large zucchini. 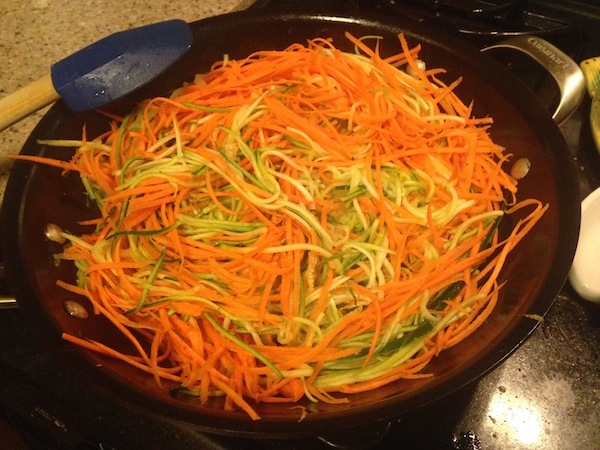 I sauteed the veggies in a big non-stick skillet, slicked with cooking spray, for 6-8 minutes. Once they got incorporated, I added back the veggies, and tossed it all together until everything was warmed through. Voila! Dinner is served! I garnished with a sprinkle of chopped fresh cilantro. The poached chicken was juicy and tender, and the veggies were light, bright, and flavorful. Best of all, this meal is crazy healthy. I can’t wait to poach again… maybe fish this time! I didn’t throw away my poaching liquid either. You’ll see what I did with it in my next post. CLIFFHANGER! This entry was posted on Thursday, January 29th, 2015 at 1:41 am and is filed under Uncategorized. You can follow any responses to this entry through the RSS 2.0 feed. You can leave a response, or trackback from your own site. You need to get a job on the Food Network, not that your current job isn’t fulfilling. Aside from the image of blood in your food, the recipe and pictures are beautiful. The food looks delicious. Who knew what Santa could bring? Thanks, Mom! Santa scored at HomeGoods this year!